Two-time Olympian Egidijus “Mean Machine” Kavaliauskas 20-0 (16) had to work harder than expected to get the win over gritty Juan Carlos Abreu 21-4-1 (19) of the Dominican Republic at the Save Mart Arena in Fresno, California on Saturday night. With the bout being bumped up to main event status after the fight between WBC junior welterweight champion Jose Carlos Ramirez and Danny O’Connor fell through 24 hours earlier, the pressure was on both men to deliver a memorable performance. The 30-year-old Lithuanian got the win, but not before being cut over both eyes en route to retaining his NABF 147-pound title by unanimous decision with scores of 97-93, 97-93 and 96-94. 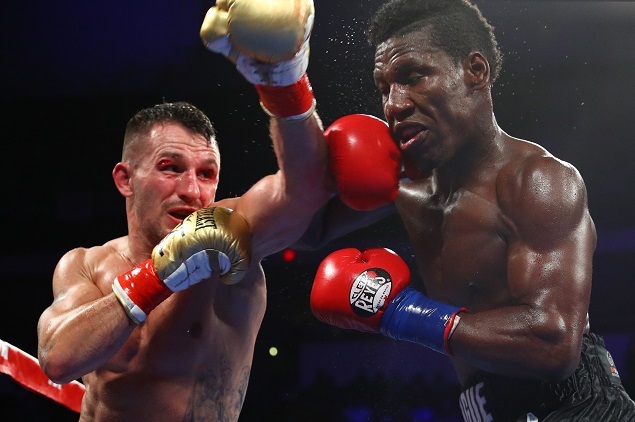 “Everything did not go as well as I expected,” the WBO number two, WBA number four and WBC number five ranked welterweight said after the fight. On the undercard super featherweight prospect Andy Vences 21-0-1 (12) kept his unbeaten record intact with a 10-round points decision win over Frank De Alba 22-4-2 (9) to retain his WBC Continental Americas title. The scores were 99-91, 99-91 and 98-92, all for Vences. In a battle between two former heavyweight world title challengers at very different stages of their careers, Andy “The Destroyer” Ruiz Jr 31-1 (20) outhustled Kevin “Kingpin” Johnson 32-10-1 (16) in a 10-round bout to win by scores of 97-93, 97-93 and 99-91. Ruiz dropped a competitive 12-round decision to Joseph Parker for the vacant WBO heavyweight title in Auckland, New Zealand in 2016. Johnson, unbeaten at the time, unsuccessfully challenged Vitali Klitschko for his WBC championship in Berne, Switzerland in 2009. The card was promoted by Top Rank and broadcast on ESPN.